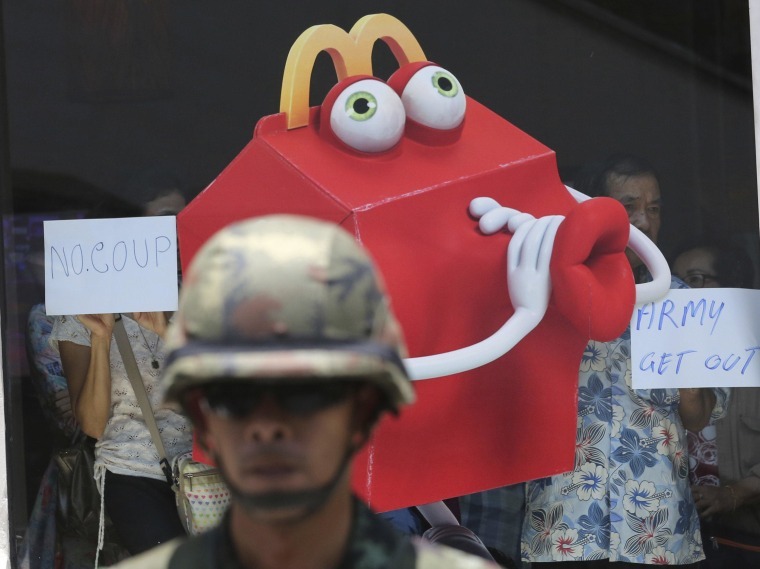 BANGKOK, Thailand — Hundreds of anti-coup protesters surrounded a downtown branch of McDonald’s Sunday, one of a number of small demonstrations taking place in defiance of a ban by the new military junta. The protest, in an upscale shopping area, came despite an earlier diktat from Prayuth Chan-ocha, the top army general who staged the coup on Thursday, who told Thais to avoid rallies, saying normal democratic principles could not be applied at this time. And later on Sunday Thailand's ruling military council stiffened its warnings, with its patience apparently wearing thin over demonstrations that have been growing in size and boldness. Hinting that the army was ready to cast off restraint, Col. Winthai Suvaree said that in case of clashes in which losses or injuries incur, no compensation can be claimed because the country is under martial law. Meanwhie, as many as 2,000 people took part in Sunday's protests, although its significance was not in its size but that fact that citizens are prepared to defy martial law restrictions on assembly. Most of those taking part appeared to be ordinary, angry Thais — rather than ‘red shirt’ anti-government protestors. At one point a group of soldiers was chased away by the crowds at Ratchaprasong shopping district, but soldiers blocked off elevated walkways linking the upscale malls and Skytrain stops to the area were suspended. News that coup leaders have "invited" independent-minded academics, activists and journalists to meet them is causing alarm in Bangkok as it becomes clear that this coup is turning out to be much tougher than the last one. Army generals seem in no hurry to restore democracy. Thai TV news channels still shut down. Very retro. Did nobody tell the generals that not everybody gets their news from TV these days. Thai army no doubt has contingency plans for red shirt backlash, seems ill-prepared for small anti-coup protests quickly spreading in Bkk. If army responds with force to rash of small anti-coup protests, it will make their claim of ending turmoil look even more ridiculous. There have rarely been happy endings when soldiers interfere in Thailand, and it appeared likely that these protests will gain traction over the coming days. At a press briefing Sunday, spokesmen for the junta sought to deflect international criticism. The United States has cut off foreign aid and canceled military exercises with Thailand since the coup. Pentagon press secretary Rear Adm. John Kirby said the U.S. also was reconsidering its long military relationship with the Southeast Asian country. The Associated Press, and NBC News’ Alastair Jamieson in London, contributed to this report.